mamidon25 has no other items for sale. Sales tax may apply when shipping to: IA*, MI (7.0%), MN*, WA*. Excellent seller a pleasure to do business! Highly recommend this GREAT Seller! Great product, quick shipping - Thank you! Quick shipping and great seller! Thank you! It's so important to take Vitamin D, I take it daily. That can get expensive, but Puritan's Pride makes it affordable. Quality seems to be fine, too. Will be ordering again, for sure. Giving it 5 stars, but haven't really tried it long. 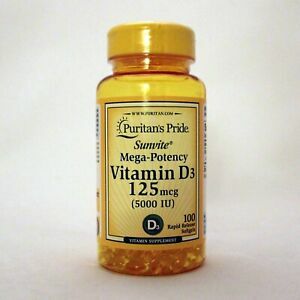 Seems like a great product though, and gives high % of daily vitamin D.
I have used Puritan’s Pride products for years and have come to appreciate the quality and value of the natural supplements. Soft gell tablet are easy to swallow. These tablets are very easy to swallow with a glass of water, the design of the cap makes quick access and works great. I take this once a day to prevent kidney stones. Can't spend much time in the sun, due to illness. I have had kidney stones in the past, don't want any again. Since taking the Vitamin D3 I have not had any problems.